A 73-year-old asymptomatic woman presented to our breast imaging center for screening mammography. Her past medical history was significant for invasive ductal carcinoma of the left breast 16 years prior that was treated with modified radical mastectomy, includ ing removal of 17 axillary lymph nodes all negative for metastasis, followed by Tamoxifen therapy for five years. At our center, we routinely obtain images of residual tissue at mastectomy sites when it can be achieved comfortably, and a bilateral mammogram was thus performed for this patient. The mediolateral oblique mammogram view of the residual tissue at the left mastectomy site showed a small, equal density oval mass with circumscribed borders (Figure 1). The mass was located at the lateral aspect of the mastectomy site and was not visible on the craniocaudal view. This finding was new when compared with prior mammograms dating 10 years back, and the patient was recalled for further imaging evaluation. Ultrasound demonstrated a 7 mm hypoechoic, oval mass with parallel orientation and circumscribed margins that tapered to a point at one end. There were no posterior acoustic features, and no blood flow was seen with color Doppler evaluation (Figure 2). The mass was noted to be located deep to the lateral aspect of the mastectomy scar visible on the overlying skin. The mass was not palpable and the patient reported no pain in this area. 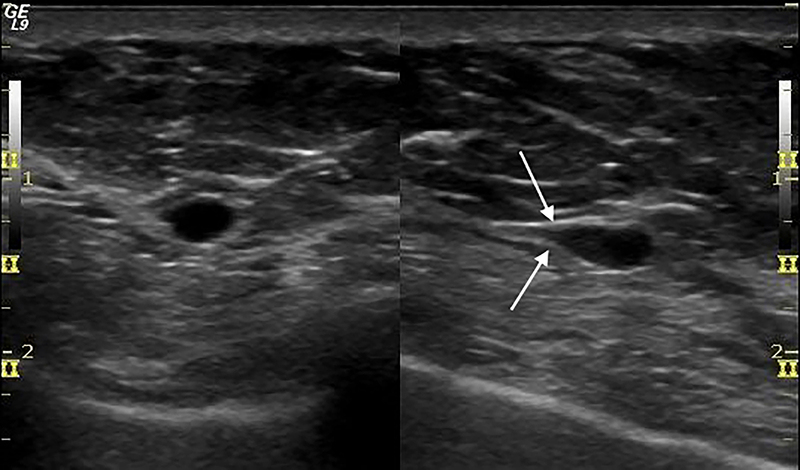 Despite the benign imaging features, an ultrasound-guided core needle biopsy of the mass was performed because it was a new finding in a patient with history of ipsilateral breast cancer. Pathology revealed segments of hyperplastic peripheral nerve consistent with traumatic neuroma. When not detected by palpation, traumatic neuromas of the breast may be discovered incidentally by ultrasound, where they almost uniformly appear as circumscribed, homogeneous, hypoechoic oval masses without vascularity at color Doppler examination. 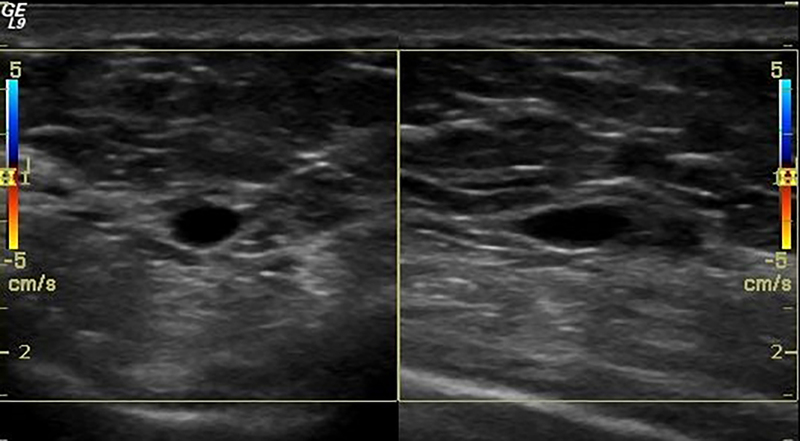 About half of the time, ultrasound shows fusiform tapering of one end of the mass, which has been described as “bulbous end” morphology or the “tail sign.”3,6,7 Of the five reported traumatic neuromas that were also investigated with MRI, only three were visible by MRI where they were T-1 isointense, T-2 variable, and showed benign persistent (Type 1) enhancement.3 There is a single report of a traumatic neuroma evaluated by PET-CT, where it showed no uptake of fluorodeoxyglucose.8 None of the previously reported traumatic neuromas were detected or otherwise visualized by mammography. Because traumatic neuromas of the breast occur in women with a history of breast cancer, they must be differentiated from recurrent breast cancer or metastatic lymph node, and biopsy is therefore always indicated. The case of traumatic neuroma of the breast that we present is similar to those previously reported in that it occurred post-mastectomy in the vicinity of the surgical scar. Although there was a significant interval of 16 years from the time of surgery to diagnosis of the traumatic neuroma, this is within the reported 2-22 year time frame. Reported symptomatology is variable, and our patient was totally asymptomatic, with no palpable lump or pain, and no pain at the time of core needle biopsy. A unique feature of our case is that the traumatic neuroma presented as a new mass on a screening mammogram, which may be related to our protocol of routinely imaging residual tissue at mastectomy sites when feasible. We observed the classic imaging features at ultrasound of a circumscribed, hypoechoic, nonvascular oval mass, including “tail sign” tapering of the mass to a point. These benign features might have normally resulted in a BI-RADS 3 designation with recommendation for short-term follow-up ultrasound in 6 months. However, the clinical scenario of a new mass at the site of previous mastectomy necessitated a biopsy to obtain a definitive benign diagnosis in this patient with the potential for recurrent breast cancer. Traumatic neuroma of the breast occurs rarely after mastectomy. It is a benign hyperplastic response of a transected nerve, often presenting as a palpable nodule in or near the surgical scar, and is also frequently painful. It is typically and most reliably evaluated with ultrasound, which almost always shows a small, circumscribed, hypoechoic, nonvascular, oval mass. Tapering at one end of the mass, the “tail sign,” is evident by ultrasound in about 50 percent of cases. While these features may suggest a diagnosis of traumatic neuroma, biopsy remains necessary to exclude the possibility of recurrent breast cancer. Boutin RD, Pathria MN, Resnick D. Disorders in the stumps of amputee patients: MR imaging. AJR Am J Roentgenol. 1998;171(2):497-501. Rosai J. Rosai and Ackerman’s Surgical Pathology, 10th ed., Vol. 2, Elsevier Inc. 2011. AlSharif S, Ferre R, Omeroglu A, Khoury ME, Mesurolle B. Imaging features associated with posttraumatic breast neuromas. AJR Am J Roentgenol. 2016;206(3):660-665. Li Q, Gao EL, Y YL, Hu HY, Hu XQ. Traumatic neuroma in a patient with breast cancer after mastectomy: a case report and review of the literature. World J Surg Oncol. 2012;10(35). Wang X, Coa X, Ning L. Traumatic neuromas in breast cancer patients after mastectomy. Chinese J Clin Oncol. 2007;4(3):185-188. Ashkar L, Omeroglu A, Halwant F, AlSharif S, Loutfi A, Mesurolle B. Post-traumatic neuroma following breast surgery. Breast J. 2013;19(6):671-672. Baltalarli B, Demirkan N, Yagci B. Traumatic neuroma: unusual benign lesion occurring in the mastectomy scar. Clin Oncol. 2004;16:503-504. Kim EY, Kang DK, Kim TH, Kim KS, Yim H. Traumatic neuroma in a breast cancer patient after modified radical mastectomy: a case report. J Korean Soc Radiol. 2011;64(5)515-518. 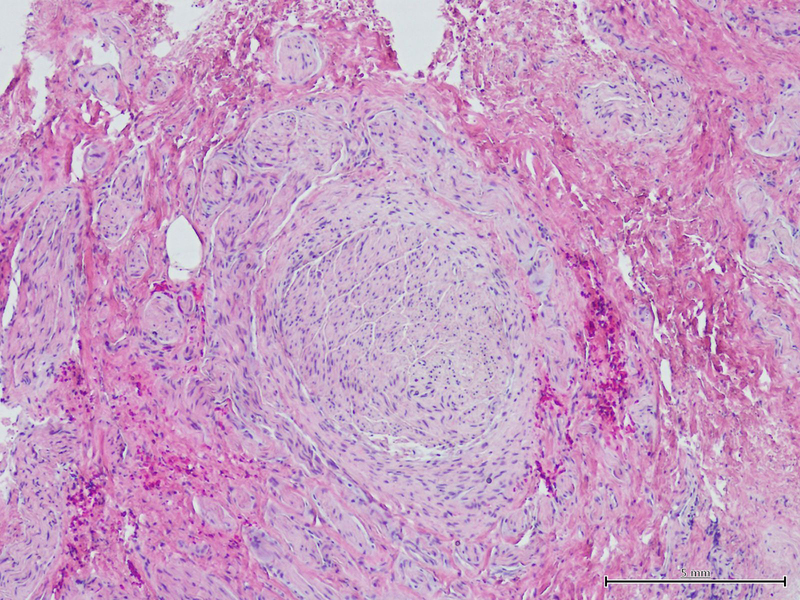 Shin S. A traumatic neuroma in breast cancer patient after mastectomy: a case report. J Korean Soc Radiol. 2013;69(5):405-407. Rosso R, Scelsi M, Carnevali L. Granular cell traumatic neuroma. Arch Pathol Lab Med. 2000;124:709-711. Fitzpatrick KA, Borders MH, MacKerricher WS, Bracamonte ER. Traumatic neuroma of the breast after mastectomy. Appl Radiol. 2017;46(6):26-28. Prepared by Drs. Fitzpatrick and Borders while serving as Assistant Professors of Medical Imaging at The University of Arizona College of Medicine, as well as Co-Medical Directors of the Banner University Breast Imaging Center, Banner University Medical Center; by Dr. MacKerricher while a Resident in the Department of Pathology at The University of Arizona College of Medicine; and by Dr. Bracamonte while serving as an Associate Professor of Pathology at The University of Arizona College of Medicine in Tucson, AZ, as well as Director of Anatomic and Surgical Pathology at Banner University Medical Center in Tucson, AZ.